The Nashville Predators have already re-signed goaltender Dan Ellis along with a flock of other players to kick off what is sure to be an eventful offseason in the Music City. For the third-straight season, the Nashville Predators finished a respectable second in the Central Division of the Western Conference only to be eliminated from Stanley Cup contention in the opening round of the playoffs. Despite finishing with its lowest point total (41-32-9, 91 points) in three seasons, the Preds did present eventual Stanley Cup champion Detroit a stern opening-round test before dropping a six-game series in which they were outscored 17-12. Additionally, the Predators averaged 14,650 in paid attendance over the last 16 home games, not including playoffs, at the 17,113-seat Sommet Center after averaging 12,640 through the first 25 contests. There’s no question the Preds will likely be one of the more industrious teams this summer. Already, the team has re-signed goalie Dan Ellis (2.34 goals-against average) and defenseman Shea Weber (six goals, 14 assists, 115 hits). In addition, defenseman Ryan Suter (seven goals, 24 assists, 75 blocked shots) signed a four-year deal worth $14 million in June, so he won't be going anywhere. Ellis (23-10-3), who led the League in save percentage (.924), was one of the biggest surprises of 2007-08 season. When Chris Mason (18-22-6, 2.90 GAA, .898 save percentage), since traded to St. Louis, struggled to gain his form from the outset, Ellis was there to seize the opportunity and took full advantage. The Saskatchewan native, who was signed from the Dallas Stars at the start of the season, was responsible for the fifth longest shutout streak (233:38) in League history, from the first period against Chicago on March 22 to 3:21 of overtime on March 30 in Detroit. Over that span, he turned aside 147 shots, and notched two of his six shutouts to play a vital role in helping Nashville snare the eighth and final playoff seed in the Western Conference. On defense, Marek Zidlicky (five goals, 38 assists, 43 points) had a 13-point turnaround from 2006-07 to lead all Nashville defensemen in points while acting as the quarterback for the League’s 27th-rated power-play unit. Zidlicky’s assist total left him behind only forwards Jason Arnott and J.P. Dumont for the team lead. Dan Hamhuis (four goals, 23 assists, 27 points, 162 hits), Nashville’s first-round pick (12th overall) in 2001, led the team in hits while Greg Zanon (176 blocked shots, 160 hits) and Greg de Vries (four goals, 11 assists, 94 blocks, 72 hits) provided a physical presence along the blue line, ranking first and second, respectively, in blocked shots. Restricted free agent Ville Koistinen, who won a bronze medal with Team Finland at this year’s World Championships in Quebec City, finished with 17 points and was a plus-13 in 48 appearances. Kevin Klein, also a RFA, played in just 13 games but left a lasting impression on the coaching staff and will likely become a regular in 2008-09. The Predators already have 12 forwards under contract, including Arnott, Dumont, Radek Bonk, Martin Erat, Vernon Fiddler, David Legwand, Scott Nichol, Jed Ortmeyer, Alexander Radulov, Jerred Smithson, Steve Sullivan and Jordin Tootoo. Arnott (28 goals, 44 assists) and Dumont (29 goals, 43 assists) finished tied for the team lead with 72 points apiece. Dumont, however, led the team with eight game-winning goals and Arnott collected a team-high 13 power-play goals. 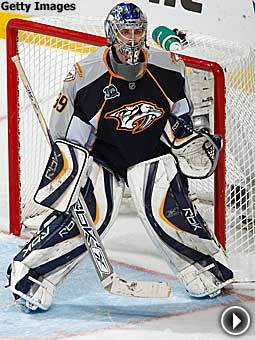 The wild card entering the 2008-09 season is Sullivan (158 points in 150 games for Nashville), who hasn’t played since February 2007 following two off-season back surgeries. Poile also expects big contributions from forward Nick Spaling, a determined two-way center with the Kitchener Rangers of the Ontario Hockey League. Spaling collected 72 points and 38 goals in 56 regular-season games and 30 points in 20 playoff games with Kitchener in 2007-08. Radulov (26 goals, 32 assists), Erat (23 goals, 34 assists) and Legwand (15 goals, 29 assists) ranked third, fourth and fifth, respectfully, in team scoring. Fiddler (11 goals, 21 assists), Bonk (14 goals, 15 assists), Nichol (10 goals, eight assists, 110 hits), Ortmeyer (four goals, four assists), Smithson (seven goals, nine assists) and Tootoo (11 goals, seven assists) were also offensive catalysts for ninth-year coach Barry Trotz. The club’s fourth line of Tootoo, Rich Peverley and Brandon Bochenski played a big part in the team’s stretch drive to the playoffs. Peverley and Bochenski are restricted free agents, while Martin Gelinas and Jan Hlavac are unrestricted. Gelinas and Ortmeyer each suffered season-ending knee injuries in February while Fiddler, Nichol, Legwand, Peverley and de Vries were forced to play through various ailments throughout. In Trotz’s eyes, the team never relented to the injury card and fought through adversity all season long. “This team was all about resiliency and a lot of resolve,” Trotz said. “A lot of people didn’t believe in us but we always believed in ourselves. We had a lot of growth on our team. After our loss to the Red Wings, I told the guys I saw some young boys turn to men and some young men turn to leaders. I don’t know how many times our backs were to the wall this year but we always responded with big games.